Yesterday I received my Ephemera January Subscription Box! 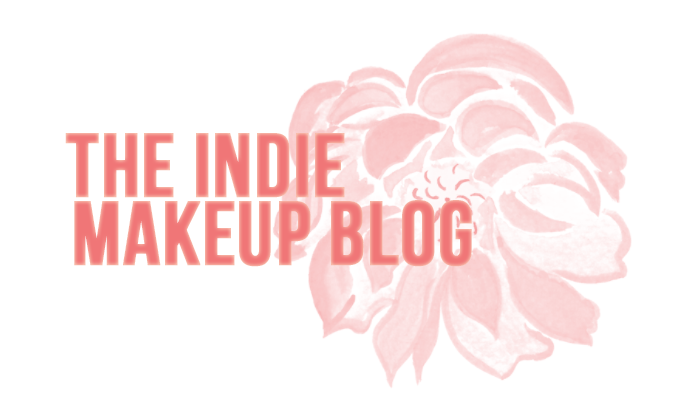 This is a brand new indie subscription box from the indie brand Aromaleigh. I have purchased from Aromaleigh in the past and was very pleased with the products I bought, the inspiration behind their themes, and their fast TAT. The Ephemera Subscription has limited slots so I'm very happy I was able to snag one! Ephemera is a word of Greek origin that signifies something being of a short-lived nature, making it a perfect name for this offering. Each month will include a range of mini jar sizes of brand new, exclusively curated products, featuring a specific theme. Boxes will also include a sneak peek (or peeks) from upcoming product releases. The themed subscription products are exclusive to your monthly box, meaning that they will not be available at a later date for non-subscription members to purchase. My box shipped on January 2 and arrived on the 5th. The price of the subscription is $17.99 with shipping for domestic subscribers. I think the packaging and labels of the products are cute. When I got it, this box was wrapped in a pretty ice blue bow. The box comes with a shadow guide explaining the products received and monthly theme. From left to right: The White Witch, 100 Years of Winter, Pale as Icing Sugar, Enchanted Turkish Delight (swatched heavily, blended out). 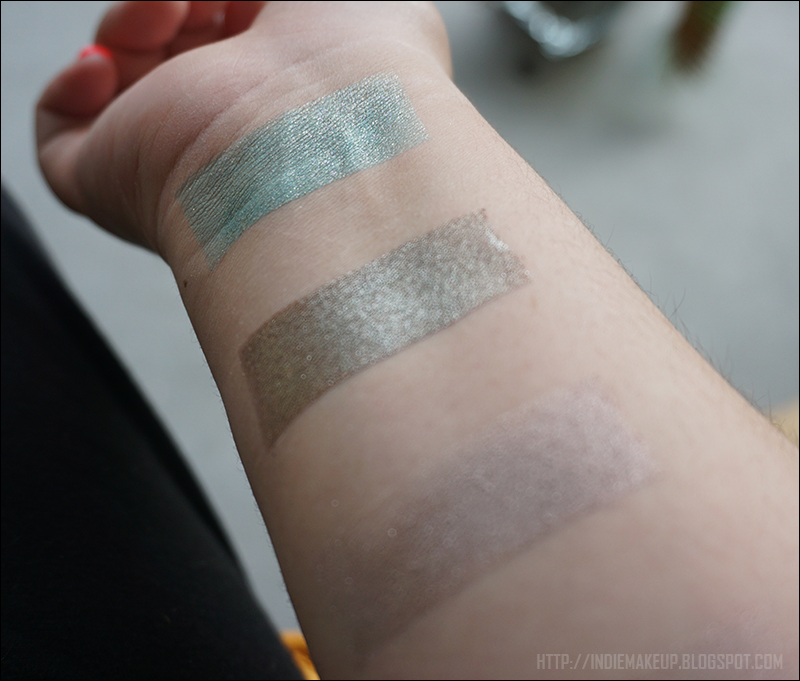 The White Witch is a pale aqua shimmer with gold duochrome. I am always drawn to shades like these, they are just so pretty! Reminds me of Notoriously Morbid's Wayward Son. This color would pair well with the new shadow very well. 100 Years of Winter is a smooth greened brown with white sparkles. Very accurate description, the white sparkles can almost look duochromatic at times. I can see his shade being used in conjunction with a lot of different shades so I feel like I'll get a lot of use out of this one as a crease shade to deepen up looks. Pale as Icing Sugar is a metallic purple-leaning taupe. 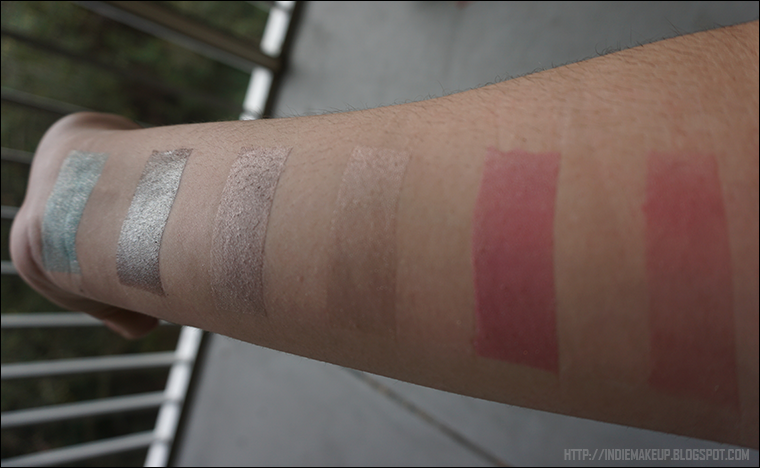 Here I've swatched it two ways as it is described as a multi-use product from shadow or face highlight. I particularly like how it looks blended out so I'm excited to try it out as highlight shade. I can see medium-deep skin tones using this as a very easy inner corner highlight shadow. Enchanted Turkish Delight is described as a winter berry with a teal glow. 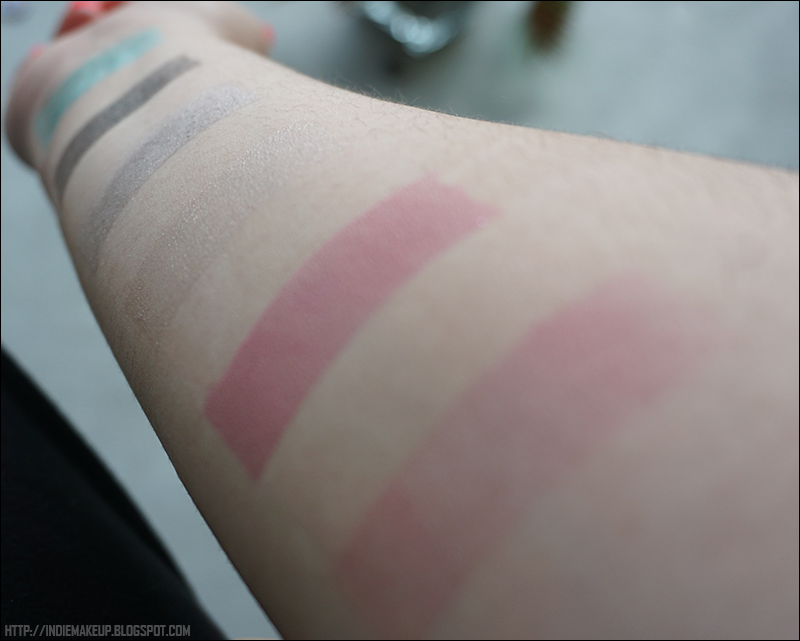 I didn't really see the teal glow in real life or in these photos but it still is a pretty blush. It's one of those shades that makes me you look naturally flushed, like you have been outside in the cold. In my box I also recieved samples from two guest brands - Ten Three Labs and Dreamworld Hermetica. I am a huge fan of Dreamworld so I was excited to see they would be participating this month. I got a clamshell sample of their new liquid lipstick. Witches Heart is a metallic burnt orange with pink shimmer. THIS SHADE IS SO PRETTY! Such an interesting lipstick shade. I haven't tried it on my lips yet but I'm so stoked to test it out. It was actually quite difficult to get off my arm so I get the impression that it may have a longer wear time. Final Thoughts: I really enjoyed the concept behind this month's box. The eyeshadows were all fairly cool-toned which went with the theme well. My favorites were Pale as Icing Sugar and the lipstick sample. I may pass along The White Witch as I have several similar shades. If I'm being completely honest, I wasn't wowed by this month's box but I am looking forward to next month's sub box. I know Aromaleigh does some amazing duochromes and purples so I hope we will see some more of those in the next coming months!